This is a remarkably well-written book. The author puts forward a clear and determined argument and successfully captivates and engrosses readers from the very first page. His assertions are presented in the most compelling manner. I appreciate books with a strong, one-sided thesis, even when – as is the case with this book – the author’s opinions differ markedly from my own. As a reader, such assertions force you to challenge and test your own opinions and ultimately sharpen the focus of your own views. 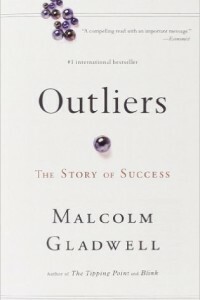 Gladwell’s thesis, in short: Extraordinarily successful people are not so successful because of any singular personal characteristics or remarkable strategies they have followed, but rather because they have benefited from amazing luck at key points in their lives. The author presents the stories of two incredibly intelligent men – the renowned physicist Oppenheimer and the largely unheard of and unsuccessful genius, Chris Langan (IQ 195) – to illustrate the fact that intelligence alone is no guarantee of achievement. According to Gladwell, research demonstrates that intelligence is a definite factor in success or failure, but this truism only applies up to an IQ of 130. Having an IQ above this level does not increase a person’s chances in life and people with an IQ of 130 have just as much chance of winning a Nobel Prize, for example, as those with higher IQs. With an IQ of 130 myself, this fact reassured me just as much as I am sure it will other readers. However, I already knew that having a genius-level IQ was not the most decisive factor in achieving uncommon success before I read this book. More important, in Gladwell’s opinion, is “practical intelligence”, for example, “knowing what to say to whom, knowing when to say it, and knowing how to say it for maximum effect” (p.101). These skills are not something we are born with, rather something we learn – and children from wealthier families pick these skills up earlier in their lives than children from poorer families. Also not such a great surprise. But is it a step too far to conclude from this that success is the result of pure luck? What about someone like Coco Chanel, one of the richest and most successful individuals of the previous century, who entered the world as an orphan? And how about Howard Schultz, an orphan who grew up in a deprived, melting-pot district and worked his way up from a Xerox sales representative to one of the richest people in America as his Starbuck’s chain grew from five coffee shops into an international concern with more than 17,000 outlets worldwide? Or Arnold Schwarzenegger, who rose from humble beginnings to enjoy incredible success in many spheres of life (sport, the film business, politics, real estate)? Are his parents, his father was a police officer, to thank? It might be possible to argue that Schwarzenegger was fortunate in terms of the genes he inherited. But that would be to ignore the fact that there are even more muscular bodybuilders and none of them have gone on to earn millions from movies or serve California (twice) as governor. There are also the “serial entrepreneurs,” business people that don’t just taste success once, but set up successful businesses again and again. Is that just down to luck, again and again? The author then proceeds to introduce Bill Gates as a further example of the crucial role played by good fortune. Gladwell has a long list of all the times Bill Gates was smiled upon by lady luck. The facts are indisputable and explain how Bill Gates became a better programmer than almost all of his contemporaries. But, what the author seems to ignore: Gates didn’t become the world’s richest man by being the world’s best computer programmer. Not at all. Gates even went as far as copying innovative ideas from other, or at least buying them at knockdown prices. His success is a result of his incredible business mind, not his incredible programming skills. Exactly the same is true for Steve Jobs and for a large number of the billionaires of the internet age. Of course, chance and coincidence do play a roles in everyone’s lives. It is recognising and making the most of these opportunities that makes the greatest difference. There are millions of people who have been presented with fantastic opportunities, but have either failed to recognise or grasp the importance of what lies before them, or have lacked the understanding or ability to make the most of the chances they have had. Vice versa: Who can say what would have become of Bill Gates if he hadn’t founded Microsoft and gone on to become a billionaire? He may not have become the world’s richest man, but he probably would have gone on to enjoy more success – irrespective of the field – than 99.99% of his peers. Of course, it’s impossible to prove this. It’s also impossible to prove that he was only successful because of the luck, chance and happy accidents that Gladwell believes lined Gate’s path. We’ll simply never know how things would have turned out if things had been different. The author puts forward a weak argument when he suggests that 20% of the richest people in history made their fortunes in one country and in one century (America in the twentieth century). This shows that external forces play a decisive role (p.50 ff.). Well, there were not only far fewer billionaires 500 years ago, there were also fewer millionaires and there was no comfortable middle-class, either. The fact that it is easier to become rich in a country such as the USA than it is in an African country, for example, is also from being a shocking revelation. Surely the real question is why, out of the 320 million people that live in the United States, only 4% become millionaires and the remaining 96% do not? Did the 4% simply have much more luck? winners. Unfortunately, most major lottery winners don’t fit into his schema as most of them end up just a few years after their big wins with less money than they had to begin with. Just Google “lottery winners who blew it all” and you will be presented with hundreds of results, each one proving that luck alone is not a guarantee of success. On the other hand there are plenty of examples of financially successful individuals who went through numerous bankruptcies, bouncing back on each occasion to amass huge fortunes. Could luck really be responsible, time and time again, for their success? Or do these individuals possess qualities and strategies that others miss? Nobody would deny that external factors and good fortune contribute to success. In the same way, nobody would seriously argue that certain individuals go through their entire lives blessed by good luck or cursed by misfortune. In most cases, the positive and the negative will balance each other out over a period of years or decades. Bill Gates and the Beatles, to take two of the book’s central examples, didn’t just experience uninterrupted good fortune; they also faced considerable problems, setbacks and difficult situations. This is true for all successful people. Their success is because of the problems they faced, not in spite of them – down to the fact that they reacted differently (better) than their less successful peers. The book’s extensive international success is not just a result of the author’s exceptional writing style, it is also a result of Gladwell’s central thesis, which soothes and reassures less successful individuals: No, you are not less intelligent, you don’t work less, you are not lacking in specific personal qualities – you’ve just not had quite as much luck and good fortune as people like Bill Gates or the Beatles. R.Z.